It is fair to say that Dickie Bird is a true cricketing legend thanks to his career as a high profile English international cricket umpire. 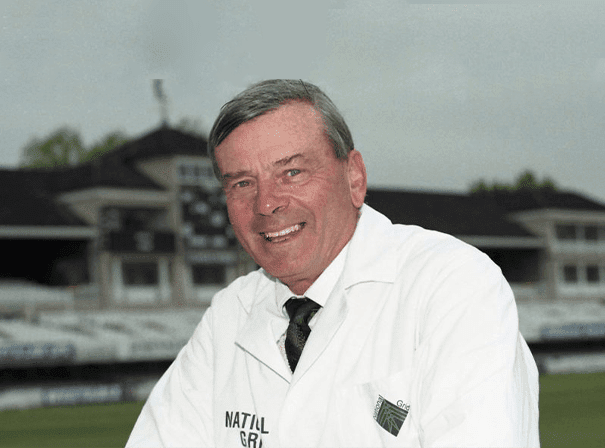 Born in Barnsley and a proud Yorkshire man, Dickie is also the president of Yorkshire cricket club and was awarded an OBE in the 2012 New Year Honours for services to cricket and charity. Bird umpired in 66 Test Matches (at the time a record) and 69 One Day Internationals as well as 3 World Cups. The reason he was such an able and respected dumpier is that his strengths included being able to manage and earn the respect of some of the more volatile players in the game, often by using his infectious sense of humour. Dickie also had a moderate playing career where he played alongside Geoff Boycott and TV chat show host Michael Parkinson, with whom he remains close friends. 56Bad nerves put paid to that though and he soon moved into umpiring. At the beginning of his 66th and final Test in 1996, the two teams – India and England – formed a “guard of honour” as he came out, and he received a standing ovation from the crowd. Post retirement, Dickie has penned an autobiography that sold more than a million copies, has set up a foundation to help disadvantaged under 18s achieve their potential in sport and appeared on popular TV show This Is Your Life.